The problem of greasy hair and dandruff fairly widespread, but by identifying the cause of the disease, you can cope with this very unpleasant phenomenon. The result will be a luxurious, radiant with beauty and health hair. The reasons causing the appearance of oily dandruffmay be poor diet and metabolic disorders, dermatosis and hormonal imbalance, the wrong shampoos and means on care of hair, hard water. Regardless of the factors that caused the emergence of this problem, consider the following guidelines in order to get rid of oily dandruff.Eliminate from your diet fatty, sweet, spicy, smoked products. Try to limit the consumption of bakery products. Forget about alcohol. Take vitamins PP and B6, found in fish and seafood, nuts, dates, tomatoes, cabbage, avocados and bananas. Multivitamin and medical yeast will serve you well: they improve metabolism and digestion, improve immunity. So twice a year undergoing treatment with complexes of multivitamins specifically developed for hair, skin and nails. 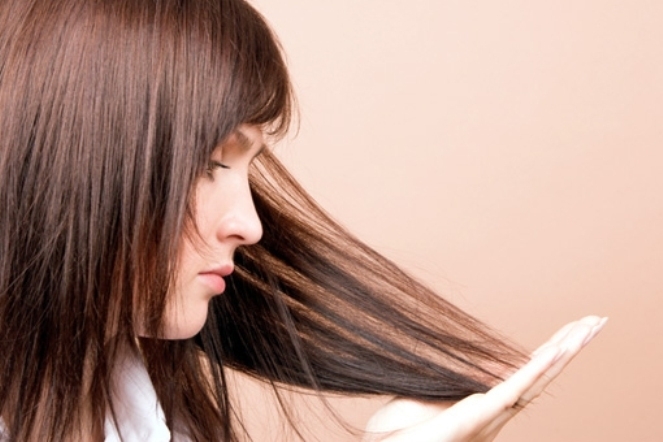 Discard the shampoo which you associate the appearance of oily dandruff. Choose less aggressive means to wash your hair, stop their attention on children's shampoos – they are the most soft and gentle on the scalp and hair. Alternate the use of shampoo with a neutral detergent. Soften hard water, which you rinse hair with boiling. Even better to rinse hair with a decoction of oak bark, chamomile, plantain, calendula. Wash your hair not hot, but warm water. Refrain from the use of hair dye chemicals. Use natural dyes: henna and Basma. Homemade mask of egg yolk, a teaspoon of alcohol and a teaspoon of water will help get rid of oily dandruff, because alcohol dries the skin, and the yolk contains substances that suppress the activity of the sebaceous glands. Use a protein mask with chamomile twice a week: chamomile decoction, add beaten egg white, mix and apply on the scalp. Use yeast mask to treat oily dandruff: 1 tea spoon diluted with warm water yeast mix with beaten egg whites and apply for 20 minutes on the scalp. Clean the scalp fresh juice of vegetables and fruits.